Situated in a quiet residential area combines beach, countryside and city. It is the perfect combination of incredible beaches (18 beaches - all EEC blue flag beaches), with the mouth of the Douro, the famous Port Wine Cellars, the waterfront of Vila Nova de Gaia and the Historic centre of Oporto/Porto (UNESCO World Heritage site). Just 2 minutes walk from our Penthouse apartment you can find beach, beach promenades, boardwalk across the dunes, cycle tracks, bus stop and regular bus service to the old part of Porto. You can reach the medieval old town of Oporto - Porto by bus in 30 minutes. 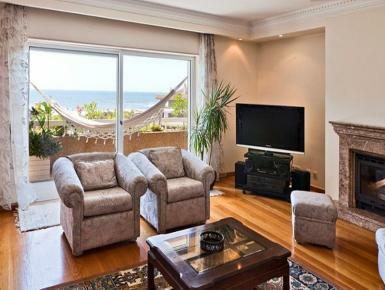 Stylish lounge and dining room (60 sqm) with exceptional view of Atlantic Ocean as well as, a fireplace, an LCD TV, play station PS3, Home Theater and a DVD-player for your relaxing moments. Plus access on to a private furnished terrace where you can quietly enjoy a perfect breakfast, a romantic, candle-lit dinner or sip a glass of champagne under moonlight night, with a beautiful sea views.